The ‘Big Willow’ circuit at Willow Springs International Raceway in southern California is may be one of the most white-knuckle laps in America. Back-to-back high speed corners leave the driver with little time to take a breather and fast cars can cover the entire 2.5-mile course in well under 1 minute and 30 seconds. Motor Trend’s in-house racing driver Randy Pobst recently teamed up with Chevrolet and Tire Rack to show what the 2019 Corvette ZR1 with the ZTK Performance Package and Michelin Pilot Sport Cup 2 tires can do at Big Willow. Fair warning: this video is essentially an ad for Tire Rack, but you came for a Corvette ZR1 hot lap, and in that sense this video delivers. Pobst manages to wrestle the 755 hp Corvette ZR1 around the ultra-fast circuit in 1:23.70. The Ford GT, by comparison, set a virtually identical time of 1:23.69 around Big Willow, also in the hands of Pobst. The production car lap record holder at the track is the Porsche 911 GT2 RS, which Pobst hustled around Big Willow in a stunning 1:21.08. Fiat Chrysler will be happy to see that the C7 Corvette’s long-standing rival, the Dodge Viper ACR, remains faster than the 2019 Corvette ZR1 at Big Willow. The 640 hp ACR set a lap of 1:21.24 in hands of Dodge test driver Chris Winkler in 2016, which remains the second fastest lap of Big Willow for a production car. Pobst praised the ZR1’s grip under braking and its front end grip through the corners, but said that it was hard to get the 6.2-liter supercharged LT5 V8’s power to the ground on corner exit. 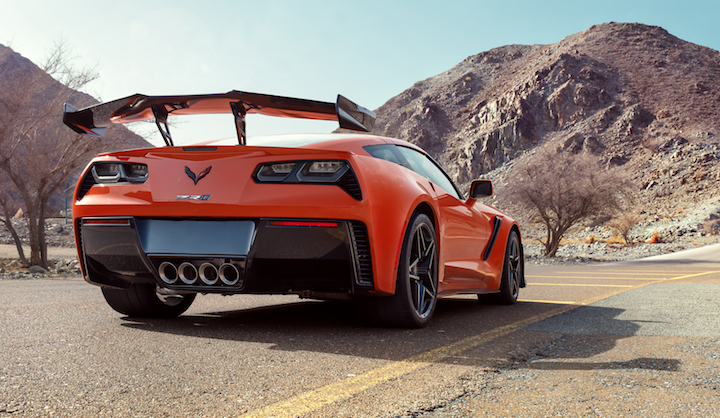 That’s not much of a surprise, really, and is part of the reason the Corvette team is switching to a mid-engine platform for the next-generation C8 Corvette – General Motors has basically exhausted the capabilities of the front-engine Corvette platform with the C7 Corvette ZR1. Check out Pobst’s 2019 Corvette ZR1 hot lap in the video embedded above. There is no embedded video that I can find. Never mind it finally loaded. This just tells me that the mid engine Corvette is going to eat the GT lunch when the top model comes how! Its pathetic that a 120k car can run exact times as the GT for about a 3rd of the price! Took you long enough to see the video. Randy has never liked, or driven well, Corvettes. I just retired after working at DuPont for 43 yrs. I am a car guy and have a question. Is it possible and if so, what would it take to ride with Randy Post a couple of laps in one of the test drives he runs I’m assuming for factories ?